As Alan Partridge might say, “B.A.D., the band the Clash could have been”. Well at least against to Partridge’s original comparison of the Beatles and Wings, B.A.D. never recorded ‘Mull o’F***intyre’ so we can start on a positive note, but I expect the odd Wings apologist out there may have something to say. On a warm summer’s evening on the night before DRC, I plonked this on and sat in the garden with the windows wide open ‘Medicine Show’ just floated outside and wrapped me up in a warm glow of 1985 nostalgia. It fitted the mood perfectly, though it was a shame it was gloomy and raining by the time we got to Rob’s the following night. A little bit of the magic from the previous night’s listen was missing in the process. Mick Jones harnesses all of the ideas on this debut album that finally got him thrown out of the Clash a couple of years before. I’m currently on the search for his original mixes of ‘Combat Rock’ to see exactly what he had planned. It’s ironic that an album which was so groundbreaking with its use of samples, drum machines, hip-hop rap, etc. can now sound so stuck in its time as a result of all that came along behind. I’m not sure how far they were influenced by B.A.D.’s rock/dance crossover but would we (should we) had to have put up with Jesus Jones, EMF, PWEI etc, etc…. A dance to the tune of economic decline, is when you do the bottom line, nagging questions always remain, why did it happen and who was to blame? Side 2 would always struggle with such a front loaded side 1, but it seemed to just about keep hold of everyone’s attention. ‘Sudden Impact’ has still got a pretty good groove all these years later. After all these years this album sounds very much of its time, but there is still enough to enjoy and mull (back to Wings again) over its later influence. 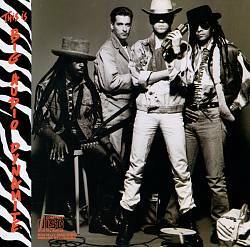 Rob Listened: I never saw the point of Big Audio Dynamite. I could hear that using samples and what we were encouraged to refer to back then as ‘beat boxes’ was unlike a lot of other stuff, but when ‘E=MC2’ was doing the rounds in 1985, I thought it was a little hokey. I’d already worn out my 7″ of ‘Hey You, The Rock Steady Crew’, spent a couple of years puzzling over the lyrics of ‘White Lines’ and within 12 months of B.A.D.’s debut, my brother was using my Grandad’s unwanted phonogram to play ‘Raising Hell’, ‘Licensed To Ill’ and ‘Yo! Bum Rush The Show’. So, I never saw the point. Plus, Mick Jones has an annoying voice. I liked bits of this though, particularly the second side. I’d have to listen again to verify, but I suspect that when the songs were more groove-based, more genuinely sound system influenced, I preferred them. They should have let Don Letts sing. Tom Listened: Having come late to the Clash party, steadfastly holding out for many years on the assumption that they were rubbish (based pretty much solely on my hatred of Should I Stay or Should I Go – a staple of indie rock discos in the early 90s and such a terrible song on so many levels…one of which is that it is crap to dance to! ), my expectations of This is B.A.D were less than favourable as Graham set it to play. I remember some of my friends at school liking the album at the time of its release but I always found the singles somewhat leaden and melodically underdeveloped. So I was pleasantly surprised hearing this almost 30 years later and finding there was much more to it than E=mc^2 and Medicine Show. Like Rob, I preferred side 2 but I found all of it much less annoying than: a) I expected to and b) Graham expected me to. Good choice Graham! Nick listened: I’m only aware of “E=MC^2”, which is one of those singles that I find almost unbearably catchy whilst I’m listening to it, but that I can only remember the name of and who it’s by once it’s finished (the opposite of my usual problem, where I can remember a chorus or hook but not what it’s called of who it’s by. None of the rest of this album struck me as being quite as naggingly earwormy as that, but it was all, at the very least, interesting on a technical level for how it was put together.